Manchester Orchestra is having their 5th annual The Stuffing at all three rooms of Center Stage this upcoming Wednesday, November 26th! Get in the spirit of Thanksgiving one day early with this music-filled, community-giving event! 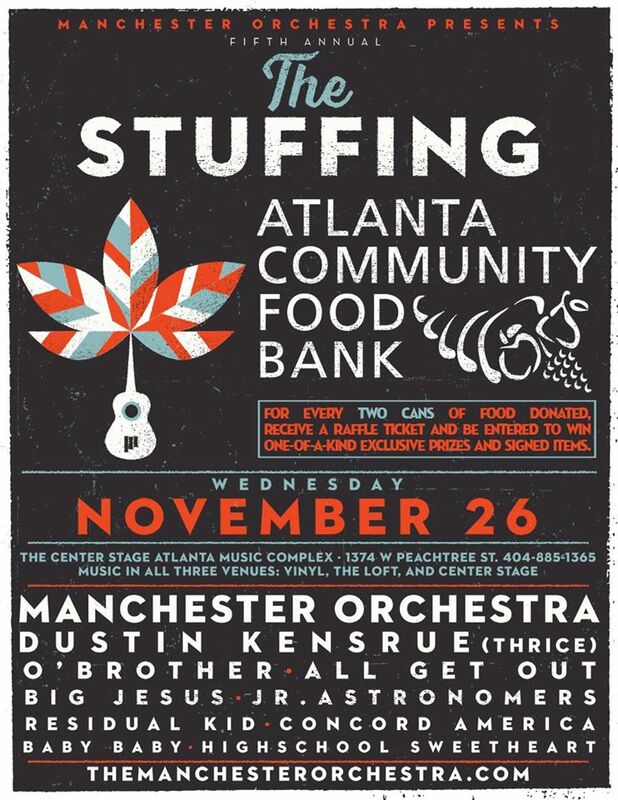 The line-up for this year’s The Stuffing includes Dustin Kensrue of Thrice, All Get Out, o’brother, Big Jesus, the Junior Astronomers, Residual Kid, Concord America, BABY BABY, & HighSchool Sweetheart. In addition to enjoying a jam-packed night of music, attendees can also give back to the community with the sponsored food drive for Atlanta Community Food Bank. For every two cans of food donated, concert-goers will receive a raffle ticket to be entered to win one-of-a-kind exclusive prizes and signed items. Manchester Orchestra was formed in Atlanta, GA in 2004 and has been blowing up the indie rock scene ever since with their exquisite songwriting and alternative blended musical stylings. The band recently released their album Hope, featuring reworked, largely acoustic versions of their previous album, Cope. Check out Manchester Orchestra’s website for more news about the exciting event!